Kanchanaburi War Cemetery, Plot 1, Row D, Grave 66, Age 29. Harry is seated 2nd from Left. Scaddan’s cricket team, with Joe Reilly standing back row 1st Left. Funeral service conducted by Padre (R.C.) Matheson. Soldier was a Kingsley Fairbridge Farm Schoolboy. 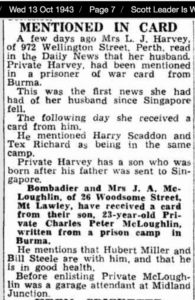 Harry Scaddan arrived in Australia 21/3/1926 on ‘Berrima’ aged 12 years. He was housed in Wolfe. His father had died and his mother was unable to take care of Harry and his sister. His sister persued her interests and talent in ballet of which Harry was most proud. His future plans included returning to England to see his mother and sister. Harry was a noted sportsboy at Fairbridge. His name is recorded in athletic events with John Ramsbottom (also 2/4th). He continued his sporting interests during his working life at Boyanup. In 1935 he was working at Boyanup for W. Smith, Esq. In 1936 Harry was working at “Bellaranga” Station, Arrino (small town located between Mingenew and Three Springs). He appears to have maintained close ties with Fairbridge (as most probably did) – returning there for his annual holidays, etc. The magazine “The Fairbridgian” 1936 records Harry attending the Mandurah Summer camp in 1936 as well as Christmas Day at Fairbridge. Another 2/4th boy present was Ted Leadbitter. Social notes mentioned Harry participated musically, he played the drums. Harry’s war medals were sent to his mother Mrs Winnie Scaddan, 148 Ush Road, St John’s Hill, London, England. Photograph taken January 2018 – flowers laid by Cheryl Mellor, daughter of ‘Cowboy’ Matthews in memory of a Fairbridge Kid who had so much potential and died in Thailand 1944 aged 29 years. When the Railway was completed al POWs working on the Burma end of Railway including Harry’s Green Force Burma, No. 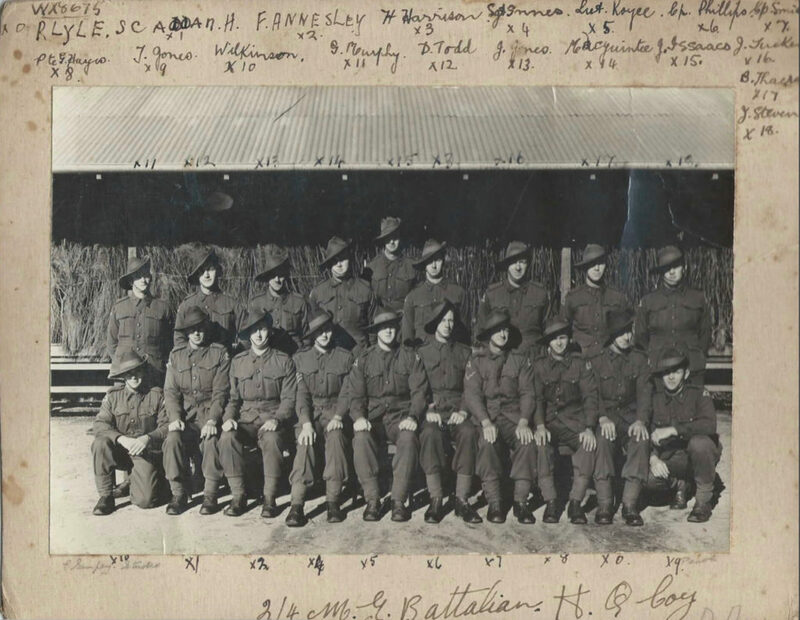 3 Battalion were sent south after end December 1943 to Thailand by various means of travel. Those who were ill suffered further. It was a terrible trip mostly by train, the sick men were without food, water and medical care. 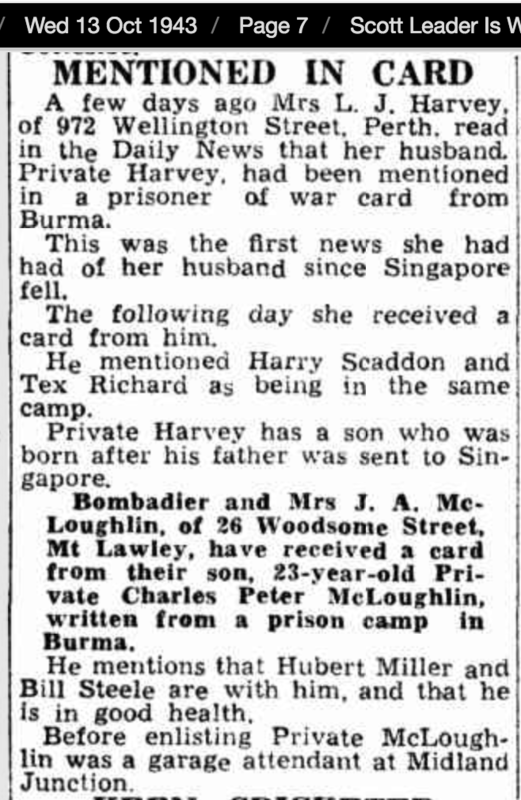 Harry was sent to Tamarkan Hospial Camp, Thailand and it was here he died of cerebral malaria on 22 April 1944.